Aseem Prakash is Professor of Political Science, the Walker Family Professor for the College of Arts and Sciences, and the Founding Director of the Center for Environmental Politics at University of Washington, Seattle. He is the General Editor of Cambridge University Press Series in Business and Public Policy and has served as the Vice President of International Studies Association in 2015-2016. 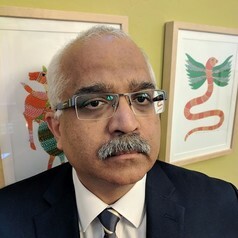 Professor Prakash is a member of National Academies of Sciences, Engineering, and Medicine's Board on Environmental Change and Society and International Research Fellow at the Center for Corporate Reputation, University of Oxford. He was elected to the position of the Vice President of the International Studies Association for the period, 2015-2016. Among his awards include International Studies Association, International Political Economy Section's 2019 Distinguished Scholar Award that recognizes "outstanding senior scholars whose influence and path-breaking intellectual work will continue to impact the field for years to come," International Studies Association's 2018 James N. Rosenau Award for "scholar who has made the most important contributions to globalization studies" and the European Consortium for Political Research Standing Group on Regulatory Governance's 2018 Regulatory Studies Development Award that recognizes a senior scholar who has made notable "contributions to the field of regulatory governance." He serves on the Economic Development Commission of the city of his residence: Edmonds, Washington.